. …a tool that responds to the way disasters actually unfold and the way people really react, rather than predicted or idealized projections of behaviour. 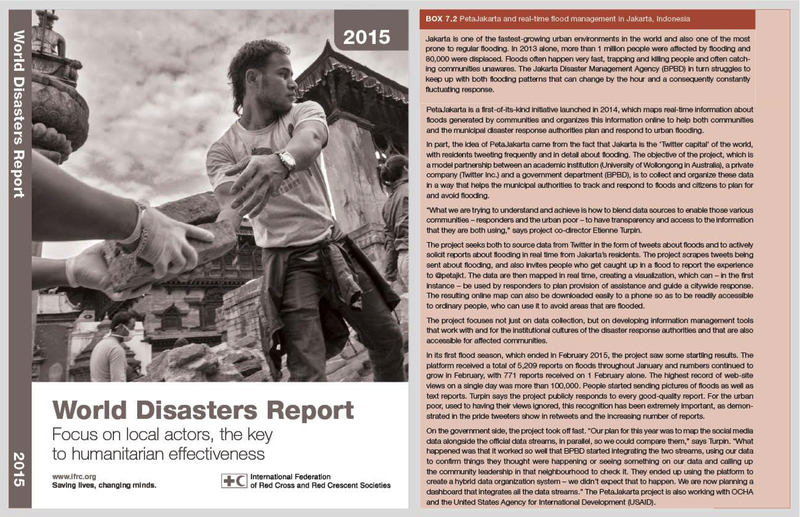 The 2015 World Disasters Report recognizes the role that local actors play in emergency situations. The pilot project, PetaJakarta.org, was recommended as a model for empowering local actors and changing the nature of community-level disaster response.
. … when we talk about not just Australia but disaster management, knowing when and where the flood is going to reach and aligning that with the information that you could provide through Twitter and layer the two together, then the capability of managing disasters of a great variation would be very useful. That is why the issue around this type of technology, working across a number of fields, could be really useful. 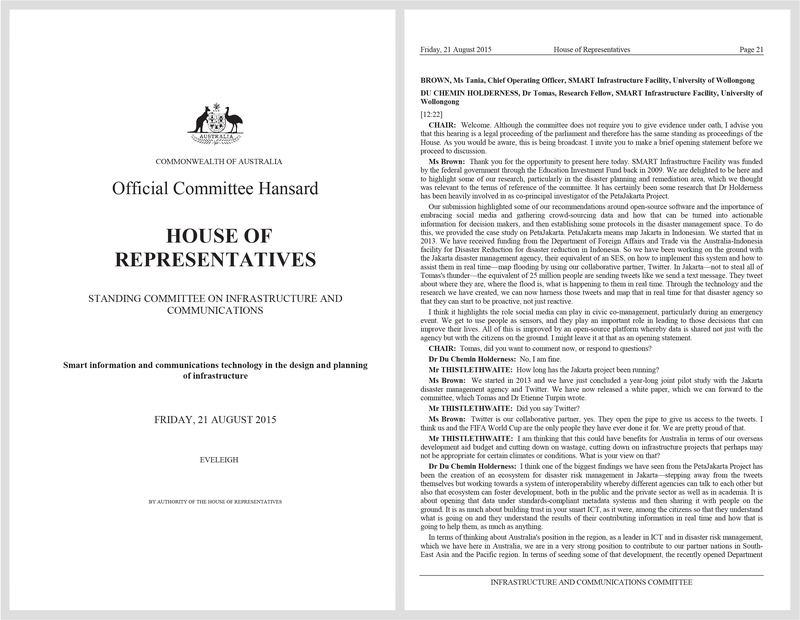 In a deposition to the Standing Committee on Infrastructure and Communications of the Government of Australia, project co-director Dr. Tomas Holderness recommended PetaJakarta.org as model for transforming social media into actionable information for residents and decision makers. The project was commended for its ability to work and integrate data openly across multiple fields. 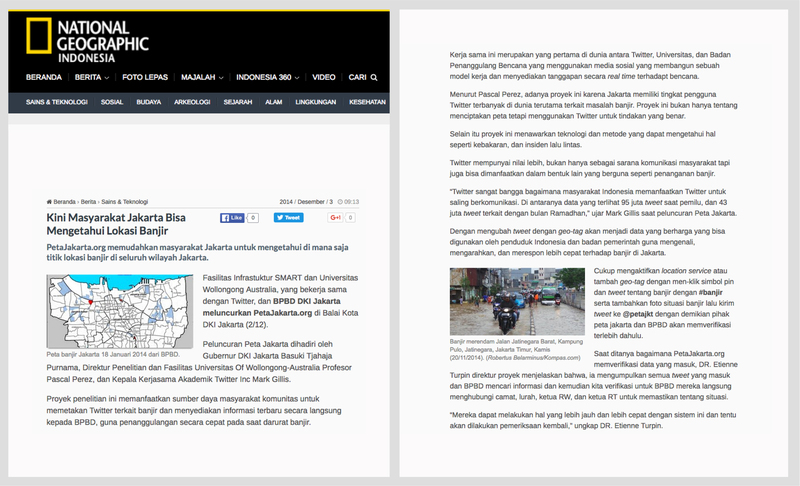 In an article titled “Now Jakarta Residents Can Know the Locations of Flooded Areas,” National Geographic Indonesia described how the platform has increased situational knowledge among residents and has become a tool for critical information sharing and dissemination in Jakarta.
. By leveraging Twitter’s real time information network, PetaJakarta.org uses social data to help improve the lives of millions of people. In 2013, PetaJakarta.org was selected as one of six recipients of the first Twitter Data Grant. The competitive program was launched by Twitter to connect researchers with Twitter data for real-world applications. 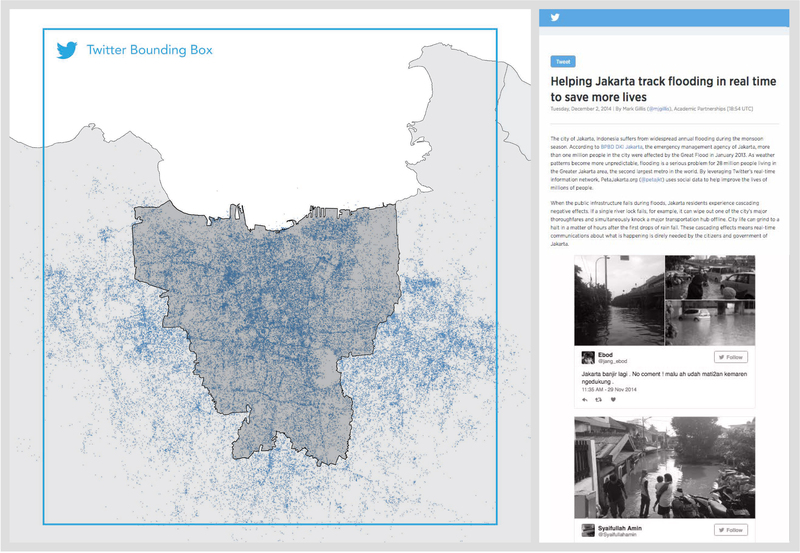 The Twitter Data Grant map visualizes flood-related Tweets across Jakarta between November 2013 and February 2014.